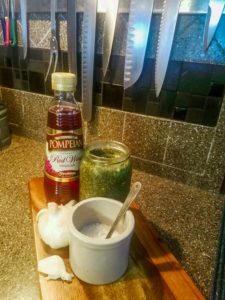 This is one of my top 3 favorite sauces … at least all purpose & most versatile sauces! I can’t stress enough that if you haven’t tried chimichurri, you MUST! And even if you have, make this one because there are as many recipe variations for it as there are people who make it so do try more than one. While you often see this sauce paired with beef & lamb, you will want to use this sauce on everything! In Argentina most families have their own recipes & it’s used like ketchup in the U.S. (I prefer their choice) Besides beef & lamb, I eat this with everything from pork chops or loin to eggs or roasted veggies and even on sandwiches or in wraps! Do you like chimichurri? What is your favorite “go-to” sauce or are you not “saucy” (I definitely am HA)? I try to avoid sauces that are full of sugar (ie; ketchup) or packed with artificial stuff… so as you will get used to me saying … JUST MAKE your sauces!!! IF we control what we put in our bodies we are ahead of the game friends. Place garlic, salt, pepper, chili flakes (or pepper) in the food processor & pulse 2-3 times. Stream olive oil into the food processor with it on low until it is all added. Stop food processor & if needed, scrape the sides down & pulse a few more times. The sauce should be thick but pour-able. 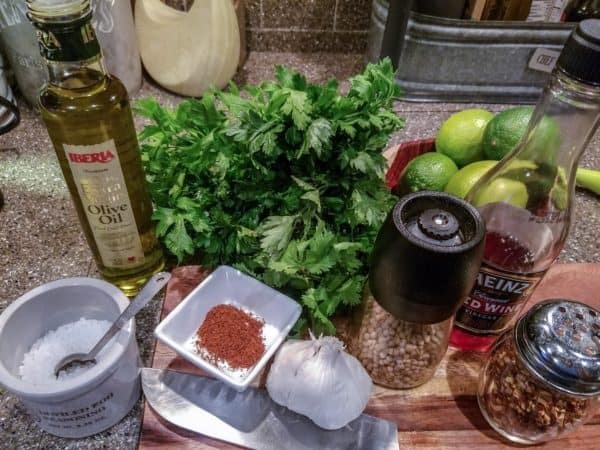 Consistency can vary due to sizes of parsley bunches so IF it appears thicker than you would like, you can always add a little more red wine vinegar &/or oil. Adjust salt & pepper to taste. This will keep in the refrigerator for quite awhile. I would probably say not past 3 months....but I bet it won't last that long! Serving Suggestion - Over Flank Steak!